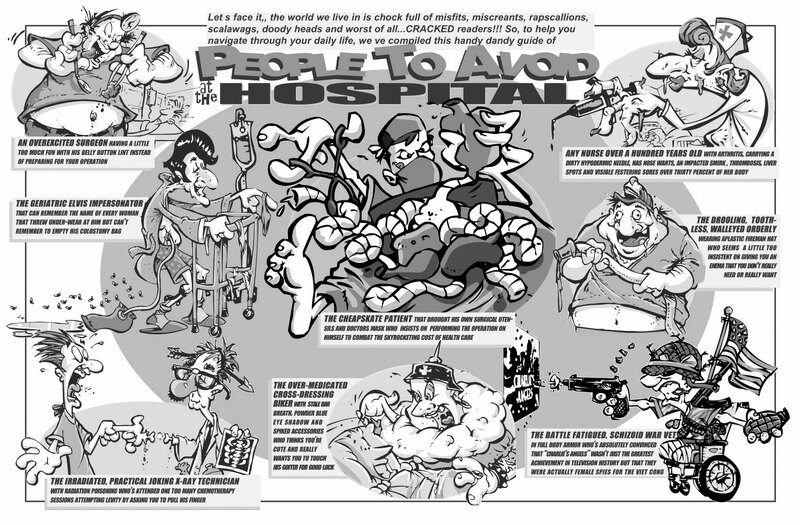 Here’s one of the first things I ever did for CRACKED magazine, it’s a double page spread entitled “People to Avoid At The Hospital. It was a lot of fun to do and I ended up doing a few of them as part of a series. Other were, People to Avoid in High School, People to Avoid on the Subway, At Work etc. because it gave me the opportunity to create interesting characters based on real life personalities. 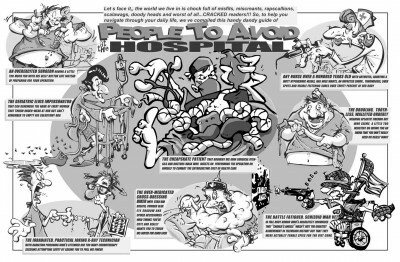 This entry was posted in Cartoon Logo & Character Design, Gag Cartoons & Comic Strips, Illustration and tagged black and white cartoon, cartoon hospital, CRACKED Magazine, illustration. Bookmark the permalink.